On my life list, along with writing a book and seeing Madonna in concert (not of equivalent ranking, mind you), is to open my own shop. As a little girl, I'd set up elaborate markets and tiny boutiques for my stuffed animals to come through and purchase with their wicker baskets in paw. 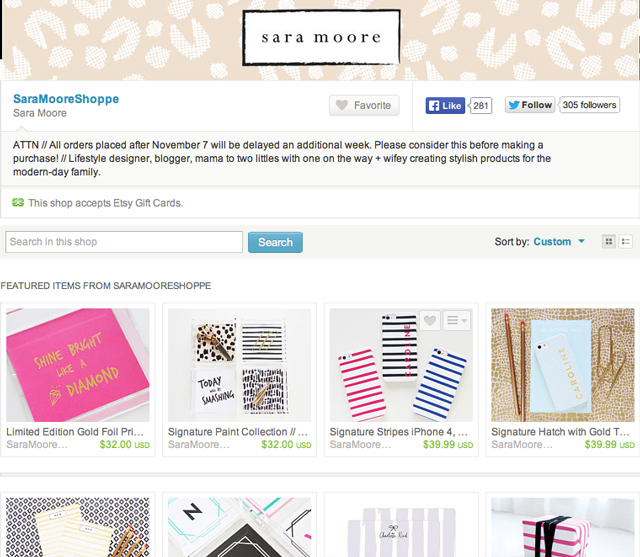 So I turn to some go-get-em ladies from the blogosphere as my heroines of on-line shops. These chicas canturn a fabulous post, curate a vintage thrift, and paint an oil like none other. I want them all to succeed beyond their wildest dreams in their neck of virtual so if you're in the market for something unique, take a look-see. Pretty please do yourself this first favor, follow along with the Painting A Day project going on at my bud, Emily Jefford's blog. Emily is an artist focused on putting her brushes to use to make some dreams come true for her adorable family. And if you are one of those (me! me!) peeps that always stops to watch artists as they create, follow Emily at BeautifulHelloBlog on Instagram where she's been posting videos of paintings in progress. I look forward to these amazing landscapes each day. She's posting at noon EST, and these are selling fast at $100 so be sure to set your alarm to buy right after she posts. In addition to these beautiful canvases, Em makes great collage works and gorgeous jewelry...pick up a few of those while you're sniffing around. Nicki from Life I Design and I met at AltNYC in June, and she convinced me to join in the 30 Day Sketchbook Challenge. Each day for the last thirty days, Nicki has published some amazing black and white sketches in the vein of what you see above. She also added in a few splashes of color (you should go see her tomatoes). Nicki is retiring some prints from the collection and new work is headed into the shop for the fall so get ready to purchase something charmed for the new teacher or neighbor in your life. My girl, Julia from Life on Churchill Street has a background in product design and has some great taste for styling, too. She's a crafter and picks up the quintessential objects. In her shop you'll find a smorgaboard of one-of-a-kind children's books, mid-century fancies, and other items you find yourself thinking you "need." Julia has an adorable family, and they abide in a fresh and vintage space. She was featured over on Design Mom in the Living with Kids series. Go check that out, too. Lidy somehow manages new motherhood while juggling her blog and crafting up a storm and supporting her store. This lady has a multitude of DIYs to roll up your sleeves and dig into. She also features some vibrant prints in her Etsy shop. I remember when Lidy first opened the shop and hearing all of her excitement about the launch. Pop over to Hello Lidy to see all her fun wares. Stop over to Mer Mag if you want a clean, creative space that will make you happy to exist. Merrilee is on my list of people I'd like to meet. Her projects are made from everyday objects, and they make me feel like I'm seeing a magician at work behind the scenes. She's an amazing illustrator, and I find her prints direct and brilliant. Get out your wish list of wall art and click over (don't forget to put yourself on that list). I tell you what, friends, few things make me happier than seeing good people with great talent succeed -- so let's support the creatives! If you are a blogger and shop owner, please leave your site address below (even if I already know you, I might not know your shop). I'd love to ease on over and possibly feature you over here on Pars Caeli. Let's have a bright weekend. And give it up for an amazing August. PS. Keep those #celebratethenormal photos coming! !